"Unable to contact DSP Concepts Server"
"Error connecting to the Audio Weaver Server"
To add those exceptions, bring up your Windows firewall settings (Control Panel, or Start Menu then type "firewall"). 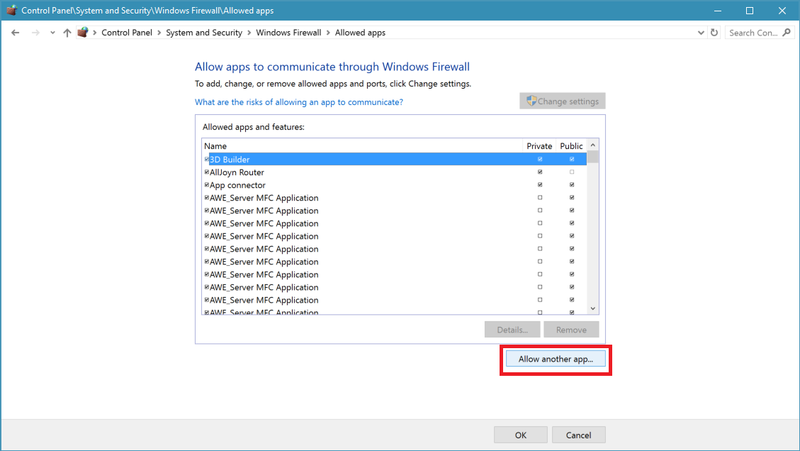 Then click "Allow a program or feature through Windows Firewall"
Note that this process may be different if you are running a non-windows firewall manager. I had that same error and have fixed it and now it comes up with "Login failure" - "User xxxxxxxxx not found at dspconcepts", Do I use the same login details that I use for the website because I have tried a few combinations and I just can't logon ? What version of Audio Weaver Designer are you using? Also, could you please try logging in using your account's email address. I tried the email login but says user not found. The version of Audio Weaver Server is 4.1 Nov 2016. The version of AWD is 5.16.A13 Standard according to the windows menu otherwise I cannot get in to see it from the About menu. After recently updating our licensing process, we found that the older 5.16.A13 version of Audio Weaver was still trying to use the old licensing. We will apply a fix to this by the end of the day and you should be able to log in. We also encourage you to update your Audio Weaver to the newest available version (5.16.B04), which has the updated licensing in addition to a number of other improvements. You can download the new version from your 'My Account' page on our website. I'm encountering this problem. Only recently though. (Line on .m references to 101). I have tried adding paths on Firewall however unsuccessfully. I have tried both 32 and 64 bit binaries. I was able to open AudioWeaver Designer AWD only once when I added the "32bit" binary. However I am unsuccessful once again. To better help you out, please share which version number and edition of Audio Weaver Designer you are running. Also, if possible please include an image of the error you receive, and your Windows version. Version: 5.16.B04. OS version and error attached. Last Friday I reset Firewall settings and launched Google Chrome. Enabled Firewall for private network (currently using) and launched AudioWeaver. Messages appeared to enable Firewall on server, gui.exe and license manager. Surprisingly, it did work after this. I have tried the same steps today however with no success. Please try running just the Bin\AWE_Server.exe and report if you get any errors. Any further steps I could follow? Hi Joe, Do you have other installations of Designer installed in your C:\DSP Concepts\ directory? If so, could you please delete the other installations and try again? I think we found the issue(at least to get it working). Designer.exe might be waiting for the server to respond and by not getting any, spits the error. However if we launch Designer.exe once again, launches correctly. Thanks Joe, we're glad you found a work around. That said, we'd still like find the root cause to your problem. Could you please share more details of what the exact sequence is? edit: Also - for clarity - do you have other installations in your "c:\DSP Concepts" directory? I use the version is Audio Waver 5.16B04 Pro. The computer system is Win 10.I have sent awe_designer to MATLAB command line.I have tried about more than 10 times but the Audio Waver Designer starts normally only once.I don't know how to do . Win7/32bit, it seams that MCR installer dont install mclmcrrt8_4.dll because AW asks for this file to be able to run AW!? Do i have to go to matlab and download the entire R2014b (8.4)? If you downloaded the STMicro Designer installer, then MCR 32-bit version 8.4 should have been installed on your machine. It is possible that you have to manually add the MCR install directory to your PATH environmental variable. When i ran the ST version install it places a matlab folder inside Audio Weaver 6.17.B01 STMicro folder! Perhaps there are some issues with your installer since matlab runtime dll's are not installed (among other files) unless AVAST is blocking your installation procedure, solution was to download R2014b then then runtime dll's are installed and AW designer boots up after AVAST asks for confirmation that some of matlab files are to be run (asking only once). Unfortunately now AW client dont connect with your AW server?! AVAST/Windowsfirewall? Dont get any warnings from either one thought, tried turning off AVAST, still no connection. Also if clicking exit on that AW confirmation box freezes computer for 20-30 sec! The matlab folder included in the Audio Weaver Designer folder contains MATLAB files that are necessary for Designer to run. This folder is entirely separate from the MCR that is also included as part of the installation. I would recommend installing Designer into the default C:\DSP Concepts\ folder, and making sure that the 32-bit, version 8.4 MCR is installed and on your PATH variable. As far as firewalls, please see the top of this chain for instructions on how to allow Audio Weaver executables through Windows firewall. If you continue to have problems, please try running '.\awe_designer.exe' from a PowerShell and report any errors. Sorry, was a bit unclear prior posts. 1: STMicro Designer always had installed into default C:\DSP Concepts\ but not the mclmcrrt8_4.dll file. 2:Running AW designer from icon, AW designer complains about lack of mclmcrrt8_4.dll file. 3:After install of R2014b, mclmcrrt8_4.dll are located in C:\Program Files\MATLAB\MATLAB Compiler Runtime\v84\runtime\win32 and AW designer/server dont complain. "Unable to connect to DSP Consepts server" (AW have been by default install enabled trough windows firewall. 5: Powershell complains about the spaces in the path names such as: DSP Concepts. Can you take a picture of the error that you receive when you launch Audio Weaver and embed it in a response? cd "C:\DSP Concepts\Audio Weaver 6.17.B03 Standard"
​boots AW, still when trying to register/connect to server same old grey box say: Unable to contact DSP Concepts server. This sometimes show up after the PC freeze and AW have closed. You are now getting the error that is covered at the top of this thread, related to firewalls. 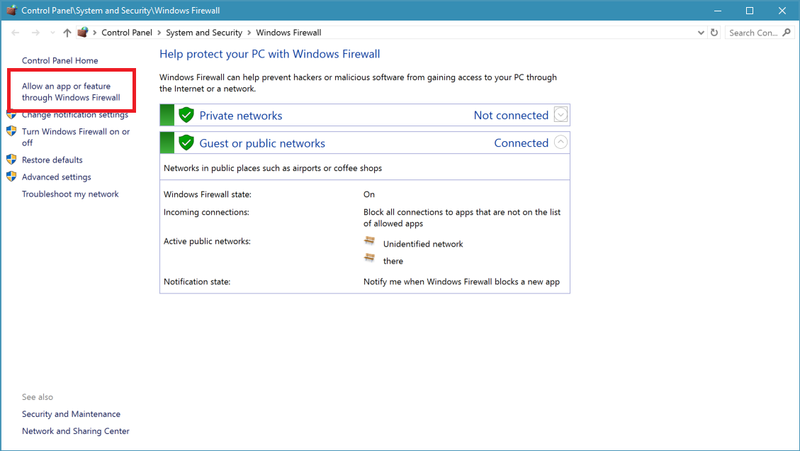 If you turn off both the Avast and Windows firewalls, are you able to connect? Do you get any errors if you launch just <AudioWeaverDirectory>\Bin\win32-vc100-rel\awe_server.exe? As mentioned earlier at first was the missing mclmcrrt8_4.dll, both Avast and Win firewalls have been off / AW enabled during this process. computer un-freeze, this surely is not a normal exit procedure for a software?! Im out of ideas! So i am getting this error along with that the designer cannot connect to the server. Which is very wierd because i had no such problems when i ran the software yesterday. I tried the solution mentioned above with the firewall setting, it didn't help. I downloaded the audio weaver two days back so i think i have the most recent version of it. 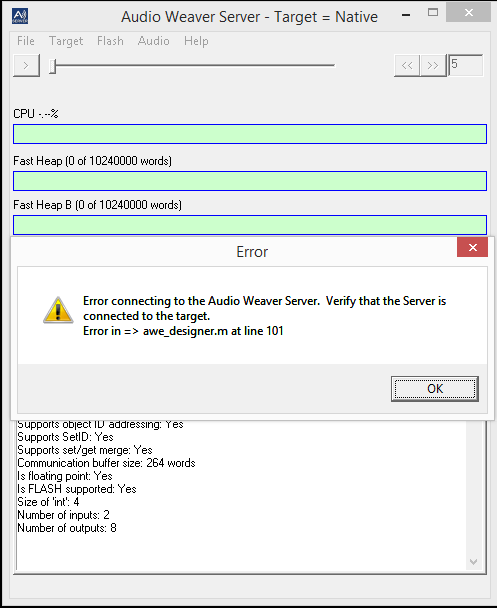 This error happens when your previous instance of Audio Weaver Server was connected to a target through USB, and you relaunch Audio Weaver with no target attached. The server is trying to find the previous target, but it is not there so it fails. This is an annoying error, and it has been fixed in the newest version of Designer, 6.17.05, available at www.dspconcepts.com/downloads. 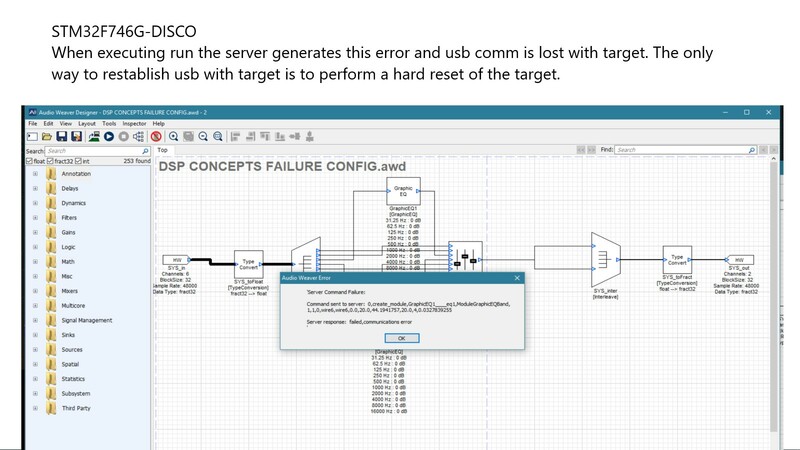 In the newer version, if the previous target connection is not found then the Server will default to Native connection and Designer will open. The workaround on older versions of Designer is to go to Target-> Change Connection on your AWE Server, and choose Native then click Change. Relaunching Designer should now work. Hi AWE Support , I have done all of the recommended privacy changes and still I have issues with the Login and Password section. perhaps I am missing something but I am still looking for answers. Thanks for posting your question. Can you provide some more detail so we can help you out? Do you see an error when you try to log in, or is your authentication rejected? Make sure that you are using the email associated with your account as your username. What version of Audio Weaver and Windows are you using? Server creation failed. Invalid ProgID 'AWETalkToGUI.IAWEControl'. I wonder what's wrong with it? Is it something about the network? I used to use AW Pro well in other Internet circumstances. It seems like one of your Audio Weaver components isn't registered correctly. Please try opening a Windows command prompt as Administrator and navigating to <Audio Weaver Install Directory>\Bin\win32-vc100-rel. Then type the command 'regsvr32 AWETalkToGUI.dll' to register the component. This should fix your problem, but if it doesn't let us know and we'll work to get you sorted out. Thanks a lot for your help. I've done as what you suggested but there were other mistakes similar. I believe there's still something wrong with registration. However I unloaded AWE and loaded it once again, it works now. I'm new and I have the same problem like others AWE's users. I use the last version of the STMicro Edition of AWE : 6.17.06 (Audio_Weaver_Designer_6.17.06_STMicro.exe). I have also installed the update file present on your website (Audio_Weaver_Designer_6.17.06_STMicro_Update.exe). I have included an exception in my windows firewall for AWE Server. I have desactivated my antivirus (AVAST, the last free version : 17.7.2314). The problem is the same : impossible for your software to connect to your server. I think the problem is the the license ID include in your last email : wrong, or maybe not activated in your database. To finish, when I use my email and your licence ID to "request offline license" in AWE, your software give me another error message : "invalid licence key". I wait your answer with many impatience. To log into Designer, you should be using the same email and password combination that you use to access the website. The license ID (a 6 digit #) that you mention is only for internal bookkeeping purposes and will not help you log in. If you continue to fail to contact our license server, make sure that you also have a firewall exception for the LicenseHelper.exe and DesignerGUI.exe applications. If you are using a proxy to connect to the internet, you can also fill in that information in the login screen once you have failed to connect to the server. To request an offline license key, which can be used without accessing the DSPConcepts License server, click on the 'request offline license' button when it is displayed, and follow the instructions there (ie, send email to licensing@dspconcepts.com with your email and 8 character hard drive serial number). I have tested with my login and my password (the same I use on your website) and the problem is always the same : impossible to connect to your server. But the error message is different : "Error connecting to to Audio Weaver Server. Verify that the server is connected to the target. Error in => awe_designer.m at line 122". I have contacted your licensing department and now I have my license key. I haven't the server error, but I can't launch your program. This afternoon, I have read all your documentation (in the AWE directory), view all your videos in your Youtube Channel, and I don't find your "ST Board Support Package (BSP) for the appropriate target" (extract from your PDF file) in your website (only the message "coming soon" in your pages) or in the BIN directory in the AWE installation (like in your videos). 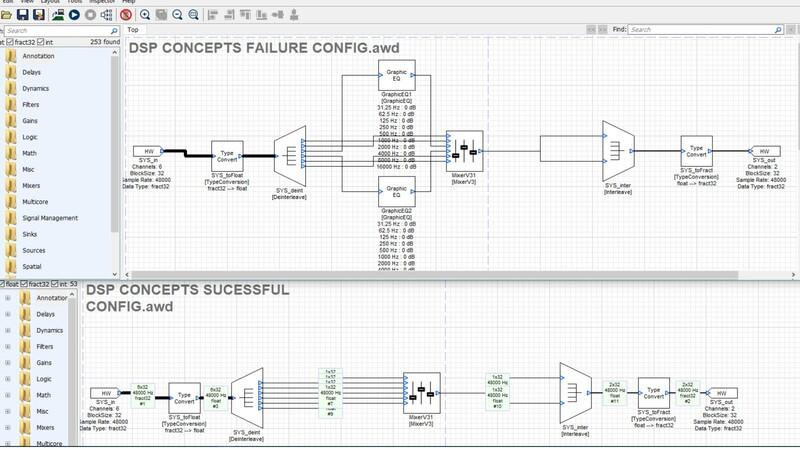 Currently, impossible to program my STM32F4xx/STM32F7xx Discovery Board with your firmware (because no firmware is included in the STMicro Edition of your AWE or in your website) and, off course, impossible to launch your program. In advance, many thanks for your next answer. The 'Can't connect to server error' that you are seeing is identical to the error described at the top of this post. You'll need to add the listed executables to your firewall exception manager. Note that if you are using Avast, then you will need to add the relevant executables to your Avast firewall, or you need to disable Avast firewall and let Windows manage your exceptions. From your questions, it is likely that the issue is with your Avast configuration and not with Audio Weaver. As for the ST BSPs, there was a critical bug that forced us to take the BSPs down for a few days. But I just reposted the new 's1.4' editions on our downloads page a few minutes ago, so they are again available. Now, I have checked your webpage and the BSP files for the STMicro Edition of your AWE software are here. I'm struggling to get Pro 6.17.06 working. I'm running a Win10 x64 VM on a macbook pro with Matlab R2017b. Paths are correct, firewall is disabled. awe_server_launch command in Matlab results in "Failed to connect to local Native Server." When I launch it, it shows that it's using the win32-vc100-rel binary. I would have expected the 64bit version. I cannot run any of the EXEs from outside of Matlab either. They all seem to fail with "Unable to start correctly (0xC000007b). Are you able to use the command 'awe_init' in MATLAB to launch the Server normally? The command 'awe_designer' will attempt to launch the Designer GUI as well as the AWE Server. Let me know if those commands work for you. awe_init gave the same response..Unable to connect to Native Server. Please try launching <AWE Designer Pro>\Bin\win32-vc100-rel\AWE_Server.exe on its own from a CMD prompt, and report any errors you see. If this fails to launch an AWE Server, you may need to re-register some .dll's in your install folder. Open a CMD prompt as administrator and navigate to <AWE Designer Pro>\Bin\win32-vc100-rel and type 'regsvr32 AWETalkToGUI.dll'. You should get a message saying that the operation was successful. Do the same for the AWETalkToGUI.dll in the x64-vc100-rel folder, and then try running awe_init again in MATLAB. Re-registered the DLLs with no change in behavior. Still reports "Failed to connect to local native server." When I run the AWE_Server.exe from the cmd prompt, I still get the error I reported above...""Unable to start correctly (0xC000007b). " It's possible that you're having issues because you are running a Windows VM on a Mac. We have not tested this configuration so it is possible that Designer can't open correctly. I would recommend installing Audio Weaver Designer on a Windows machine, or dual booting into Windows on your Mac. Low and behold as of today Jan 25 2019 I am experiencing the same issues as the others here over two years ago. However this error is related to the Graphic Eq (float)component addition. 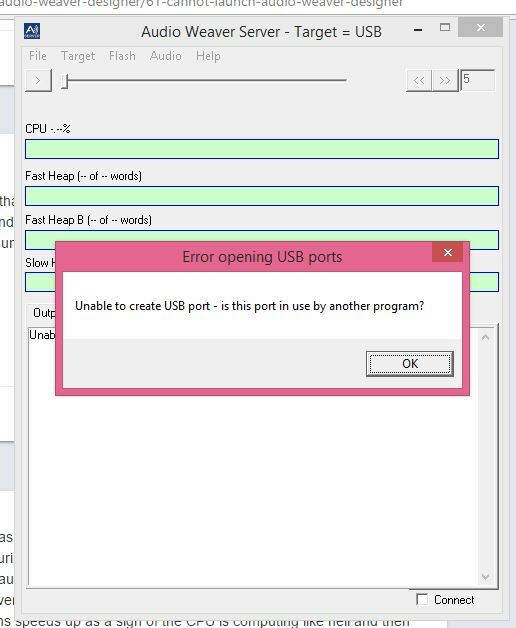 The difference in my case occurs when I add a Graphic(Float) EQ then it looses server connections and target usb. Below are the two configurations . Once a Hard Reset of the target board is performed the Successful configuration can be opened and RAN. Now stop the program and try adding the Graphic Eq anywhere before or after the Mixer. FYI: The Mixer is configured 6:1 with values top to bottom 001100 using line in and mixing to mono out. Therefore you would use only one Graphic Eq positioned after the mixer output. In my example shown I tried using two after the de-interlace on the LINE R and LINE LFT outputs. Either placements generate a fault with the server . Could be a component based bug? Also I cannot use the flash utility because of this hard coded garbage dummy file name that does not exit and cannot be removed. 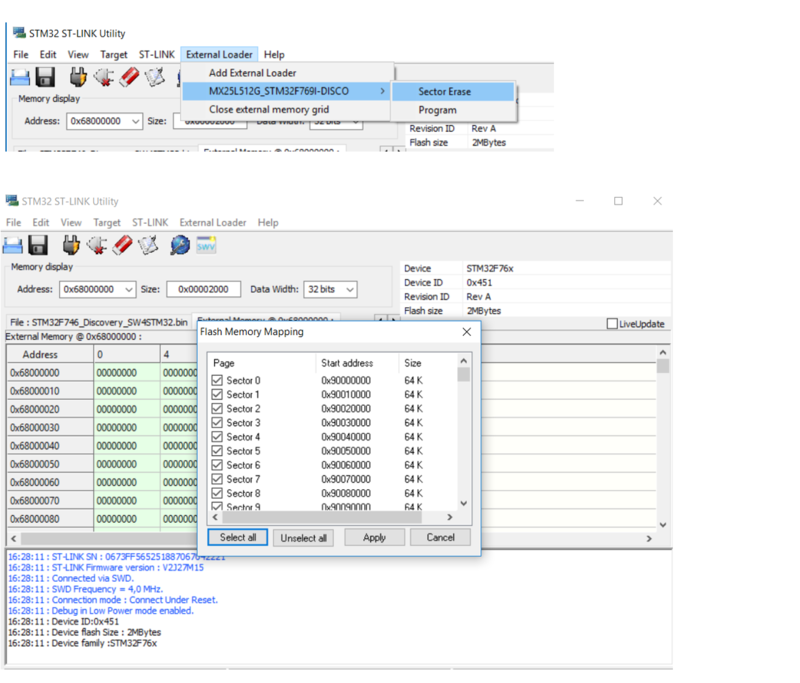 For the Flash File system issue, please try the following steps in the ST Link Utility with your STM32F746 board plugged in. Note these pictures are for the F769I board, but it should look nearly the same for the F746. 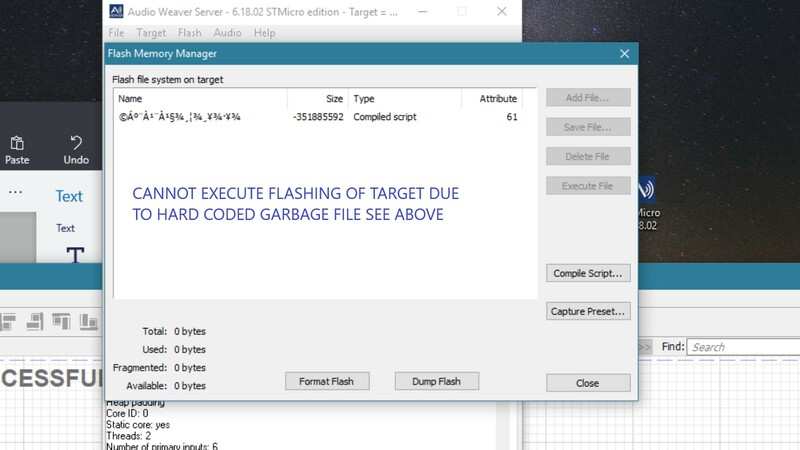 These steps will clear out the QSPI flash where we host our Flash File system, and you should no longer see any invalid files in the Flash Manager. We will try to reproduce your issue with the Graphic EQ next, but just wanted to get you going with the Flash File system first.